This article is about the character in Teenage Mutant Ninja Turtles. For the The LEGO Movie character based on the real-life artist, see Michelangelo (The LEGO Movie). 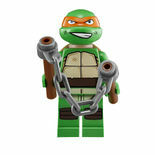 Michelangelo is a Teenage Mutant Ninja Turtles minifigure released in 2013. He is one of the main protagonists. Michelangelo's head is a new mould made for the turtles. It is bright green with an orange bandana around it. In 79100 Kraang Lab Escape he has an excited smile, but in 79104 The Shellraiser Street Chase he has a determined smile with his tongue sticking out he has an excited smile. He wears a new turtle shell piece made exclusively for the Teenage Mutant Ninja Turtles line. It is tan, has a turtle shell pattern, and a brown strap over the piece. The front of Michelangelo's torso piece is green with turtle scales and a continuation of the strap piece from the shell piece. The back of the torso features turtle scales and a brown strap at the bottom. His legs are green, just like the rest of his body, and finish off the scale printing. The legs have printing of brown knee pads. Michelangelo was formerly, along with his three, older brothers, a normal turtle, who was bought in a pet store by Splinter, when he was a human named Hamato Yoshi. Yoshi then saw many strange men (The Kraang) meeting. Those men carried a mutegen and when confronted by Yoshi, it was dropped onto the turtles spilled cage and Yoshi. The mutagen mutated Michelangelo and his three brothers into larger, more intelligent mutants, while turning Splinter into a giant rat. He then hid out in the sewers for 15 years, until the four turtles persuaded Splinter to let them go up to the surface. In the show, he is one of the main protagonists alongside his three brothers. He is the one who loves to party and goof off. In the show he is voiced by Greg Cipes who also voices Iron Fist in Ultimate Spiderman. He and Donatello are a brighter shade of green than Leonardo and Raphael. Michelangelo cameos as a Master Builder in The LEGO Movie.